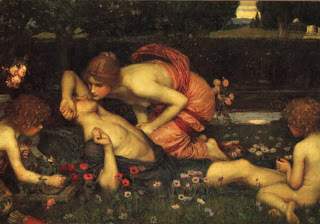 This painting by Waterhouse tells the story of Adonis' past, present and future. In the background is his mother, changed into a Myrrh tree to escape her father's wrath. In the foreground, anemones which will be created by Aphrodite's tears at his death. And the central focus, Aphrodite and Adonis. Aphrodite warns, begs, pleads for Adonis to have a care, to guard his life if only for her sake. But Adonis, who fears nothing because he loves nothing, goes on his reckless way.